Yuvan Shankar Raja Ilaya Raja (Tamil: யுவன் சங்கர் ராஜா ; born 31 August 1979) is an Tamil film score and soundtrack composer, singer and occasional lyricist. He has predominantly scored music for Tamil as well as several Telugu films. 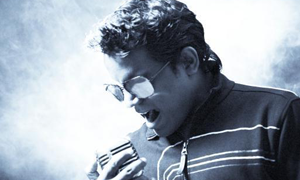 His musical career began in 1996, at age 16, as he composed the film score for Aravindhan. After initial struggle, he made his big break with the Thulluvadho Ilamai soundtrack (2001), and evolved as one of Tamil cinema's most sought-after composers by the mid-2000s. Within a span of 14 years, Yuvan Shankar Raja worked on over 85 films. Considered a versatile composer, he often strives for different and innovative music and has explored and used elements of various genres in his compositions that range from folk to heavy metal. He is particularly known for his use of western music elements in his pieces and often credited with having introduced Hip hop to the Tamil film and music industry and having started the "era of remixes" in Tamil Nadu. Being immensely popular among the younger generation, he is frequently referred to as the "Rockstar", and the "Youth Icon of Tamil Film Music". In addition, Yuvan Shankar Raja is recognized for his background score in films (re-recording) that have fetched him accolades among critics. He has won two Filmfare Awards; the Best Music Director Award in 2004 for his score in the drama 7G Rainbow Colony at age 25, remaining the youngest winner of the award, and the Special Jury Award in 2009 for his Telugu musical Oy!. Besides, he received two nominations for Filmfare Awards, one Tamil Nadu State Film Award in 2006 and the Cyprus International Film Festival Award in 2006 for Raam, becoming the first and only Indian composer to win it.